A trip down the ‘patch’ produced a few good birds. 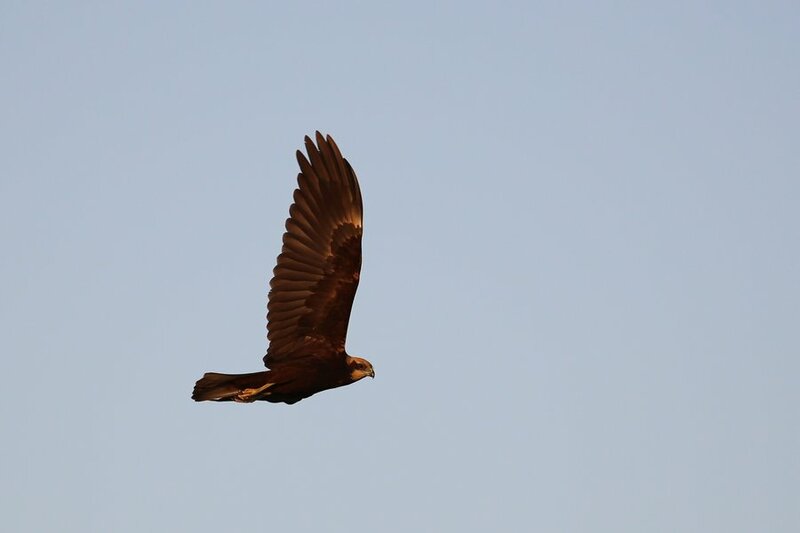 One juvenile Greater Spotted Eagle was seen in the trees surrounding the percolation pond and then later in flight over the spray fields. A female Western Marsh Harrier was quartering the reed beds of the percolation pond giving very good views but the light was not so good for photography. The pond itself had four Gadwalls including a fine looking male and the Great Crested Grebe was still present. A small movement of Pallid Swifts was occurring with up to 30 birds moving through, which are the first sightings of the species I have seen for about a month. The Spray fields had up to ten Tawny Pipits and a Red-throated Pipit present and a female Desert Wheatear was busy feeding in the scrub to the side of the fields.